Ahhhhh! The Queen (along with everyone inside the Beltway), is taking her kingdom into exile and scattering her unused ball tickets and seat passes like breadcrumbs along the way. She wishes all of you the best in finding your way around our newly entombed city. Have an extra glass of champagne glass for us. Were you all holding out for some sort of Turner Inauguration Ball? Dear readers, we must urge you to clear your dance card and take refuge somewhere else for the big evening of the 20th. But if you just can't miss this, follow Roxanne Roberts' wise advice: WEAR FLATS. And, we'll add, shove a PowerBar in your pocket and bring a plastic flask so you can get through those metal detectors. And do tell us how it goes, braving the cold and crowds! We won't laugh, we promise. For those of you landlocked in Virginia and beyond, MSNBC has gone above and beyond the call of duty to bring you the action in every way possible. We'll watch on a regular TV, but if that's just not festive enough for you, they'll also be broadcasting on movie screens and in Starbucks shops across the country. If you're feeling lonely on Inauguration Day, go share the excitement with your neighbors! Or, at least, with a frappucino. Unless you have some sort of access to Washington's inner circles, for the love of God, STOP PITCHING STORIES until Wednesday. Nothing short of Michelle Obama waving your flag will get you issue placement in a city that will be drowning in pomp and very little substance. 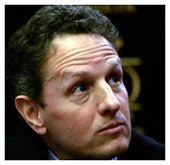 Obama's people are embarking on an exhaustive PR push to save the nomination of Tim Geithner from his tax slip-ups. Expect the fruit of their efforts to be judged next week, since the GOP has already screwed up by postponing Tim Geithner's confirmation in order to dig up more dirt. Playing Russian Roulette with important economic figures isn't the best foot to start on if you want to be an effective minority voice. Expect Dems to respond to it by displaying the concrete details of their stimulus package. The House has passed the Lily Ledbetter Fair Pay Act and the Paycheck Fairness Act. Alas, only Ledbetter is on its way through the Senate. Since that only returns women to the rights they had before Ledbetter, we need the Paycheck Act to move through as well. Do women really have a forum, or do they just think they do? Or is this just grandstanding by Mikulski to get the Ledbetter Act out on her own? Oh dear... We thought at least Bank of America was safe. But now they want more bailout funds. The second batch of funds has been released, and we'll be Googling frantically to keep track of what's going on with all this money. If you get a tip before we do, let us know! So...that's it? A paltry farewell address to wrap up eight years of the weirdest political sideshow we're likely to ever see? From what little we can gather, the last week could be Bush trying to plant seeds for a revolution of neo-conservative thought years from now. Now that conservatives are out in the cold, those seeds stand little chance of germinating anytime soon. Truth be told, Bush got upstaged all afternoon by the heroics in the Hudson River by Chesley Sullenberger, who executed a picture-perfect emergency landing in the water with zero fatalities. Real-life heroics to take the wind out of the dying Administration's sails. A secret FISA court has said that phone companies must comply with unwarranted wiretapping. Is this the last gasp of the Bush administration or a green light for Obama? O has pledged to not prosecute the sins of previous presidents and to keep moving forward. The CIA is with him on that, but what do you think, dear reader? A secret FISA court has said that phone companies must comply with unwarranted wiretapping. Is this the last gasp of the Bush administration or a green light for Obama? O has pledged to not prosecute the sins of previous presidents and to keep moving forward. The CIA is with him on that, but what do you think, dear reader? It is only fitting that during the last week of the Bush Administration (pause for popping champagne corks), there was one last admission of wrongdoing. The dubious honor goes to Susan Crawford, who admitted that Mohammed al-Qahtani, the 20th 9/11 hijacker, was in no uncertain terms tortured. Perhaps this helped Eric Holder the most in his confirmation hearings by giving him the chance to make a very public stand against detainee abuse. From Ben's Chili Bowl to George Will's residence (flanked by his conservative brethren), Obama has already proven his versatility in navigating the Beltway's ins and outs. Hopefully he can continue this without tying up traffic too badly. We have been spoiled by our outgoing decider, who spent a total of 400 days in Crawford, Texas, and avoided our fair District like the plague. With American Idol and 24 tanking in their season premier ratings, we're giddy over this farewell to Bush-era vapid and/or obscene displays of human and musical suffering. Though we have a confession to make: We couldn't stop watching Ryan Seacrest trying to high-five the blind contestant. Anyone still wondering who voted for Bush twice? Give Roland Burris a gold star. He not only overcame the long oppressive shadow of the most hated Frankie Avalon impersonator in the country, but also convinced a strong opposition within his own party to recognize the validity of his appointment. Chutzpah we can believe in! Is this the new example of political persistence in Obama's Washington? Oh and be sure to get our take on the imperiled Seattle Post-Intelligencer on the TR Blog. Insight! Analysis! Loud proclamations of expertise! How can you resist? We were very afraid that Jon Stewart wouldn't be funny in the snark-free era of hope, but thank God he's starting to get his licks in on the new admin already. Special thanks to Awkward-Grandpa Biden (the impressions bit in the video are just priceless).